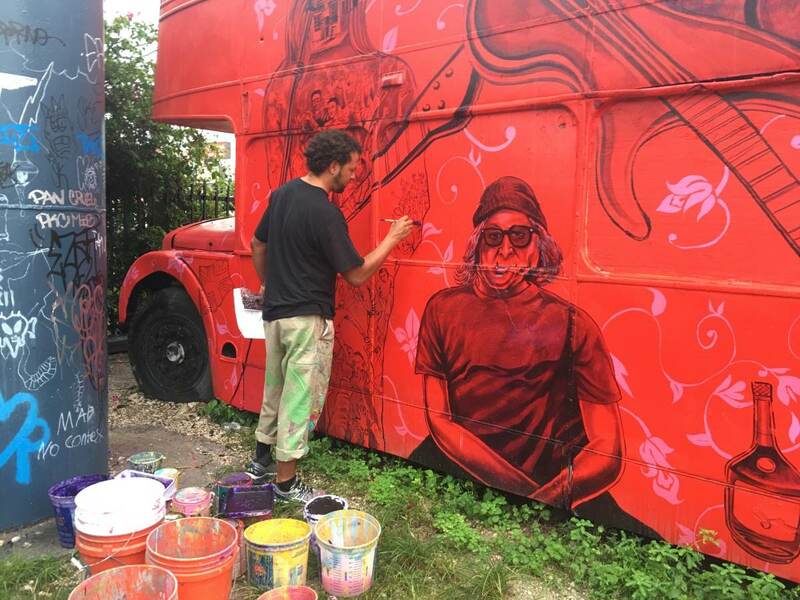 As Churchill's Pub celebrates its 38th year anniversary, two artists will celebrate life by painting a mural on one of Miami's most beloved landmarks, the Churchill's double-decker bus. The mural will depict the everyday scenes of bands, artists, and musicians that have played at the historic venue. When speaking with the artists behind the creativity, a deeper meaning is revealed. Artists Kyle Holbrook and Kevin "Smurf" Morris are no strangers to each other (or to Churchill's). They have collaborated previously on the Little Haiti Earthquake Remembrance Mural in 2011 and at Little Haiti Soccer Park. Smurf is excited to return to the neighborhood he grew up in for the project. In 2015 "Smurf" was robbed while walking home after cashing a check. He was stabbed several times and hospitalized in critical condition. It was unknown if he would live to paint again. Luckily, he pulled through, and now he is painting for the first time in 2 years. Rehabilitating his hand has been difficult but painting the Churchills mural has been "A rebirth of my life as an artist," says Smurf. Kyle Holbrook inspired Smurf to begin painting murals in 2010 and the two have done works in Texas, New Orleans and Pennsylvania. The two are excited to create a Landmark mural for the iconic Churchill's Pub. The mural will be completed just in time for the pub's 38th anniversary weekend. To celebrate Churchill¹s is featuring an all-out bash of a concert lasting 3 days, with 3 stages, and no cover all 3 days. Complimentary beverages will be served from 5p-7pm each day. Titled "38 Years of Churchills," the concert will run from September 1st through September 3rd.